Deborah McCormick Reed of Edgartown died at her home on Jan. 5, 2019. She was 88. 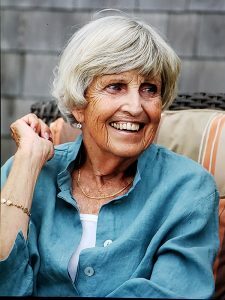 She was born on Sept. 16, 1930, in Attleboro to Sam and Virginia McCormick, who were longtime summer residents of Oak Bluffs and Edgartown. She died peacefully at her beloved 300-year-old saltbox home, which has been in Deborah’s family since 1945. She never missed a summer on Martha’s Vineyard, and in 1989 moved to Edgartown year-round with her late husband Malcolm (“Mac”) Reed. Deborah was raised in Attleboro, went to House in the Pines Boarding School in Norton, and to Goucher College, where she was an English major. She was an avid horsewoman in Attleboro and Norton, and on Martha’s Vineyard, riding all around West Tisbury with her mother when she was young (back when the horses could just walk on the ferry!). She also loved sailing and racing with the Edgartown Yacht Club, or just being on the water or swimming at any of the Vineyard beaches. She loved everything there was about the Vineyard, from the people she knew in each community to knowing that each town was unique in its own way. Her parents made sure they explored a different area of the Island on their Sunday drives so they were familiar with every town. Mac and Debby met in Edgartown over a Regatta weekend in 1958, and were married the following April, 1959. They lived in Darien, Conn., for 35 years, where they raised their three children and where Deborah was active in many organizations, including the Red Cross, Junior League, the First Congregational Church, Ox Ridge Hunt Club, and Pegasus Therapeutic Riding program, just to name a few. Once here on Martha’s Vineyard she joined PEO, the Unity Club, volunteered at Council on Aging, Rising Tide Therapeutic Riding Program, and Sheriff’s Meadow. She also loved her retail jobs at Traditions and Past and Presents. She is survived by their children, Christopher Reed, Lucinda Reed Wittenberg, and Melissa Reed, who are now Island residents; daughter-in-law Molly Burt Reed and son-in-law Charlie Wittenberg; and seven grandchildren,: Olivia Reed, Colby Reed, Benjamin Wittenberg, Jackson Wittenberg, Charlotte Hammond, Malcolm Hammond, and Tessa Hammond. She is also survived by her brother, Peter McCormick, and his wife, Fair Alice Bullock McCormick, of Marion. A memorial service is planned for Saturday, Feb. 2, at 11:30 am at the Federated Church in Edgartown. A private interment will be held at a later date. In lieu of flowers, donations can be made to the Federated Church, the Martha’s Vineyard Animal Shelter, or the Smile Train, an organization to help children with cleft lips.